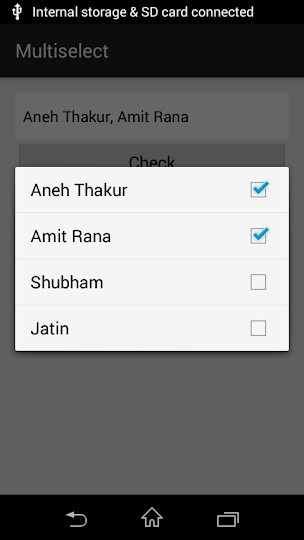 In this tip i show you how we can select multiple item inside a spinner using checkbox in android. With the help of MultiSelectionSpinner class. Step 1. First add this class in your project which help you to achieve multiselect feature in your spinner. * Created by Aneh Thakur on 5/7/2015. Step 2. Now add view in your activity file where you want. Step3. Now open your MainActivity.java file in which you want to get you selected item. Hope this code help you.